This image shows excavation of the dam identified by the UC-led team. A collapsed sluice gate is outlined in red. These are veneer stones of the dam identified by the UC researchers. What was once thought to be a sluice is outlined in red and is now filled with slump-down debris. This is a view of a Maya-built canal. Pictured is Guatemalan researcher Liwy Grazioso, who has participated in the work by a UC-led team. 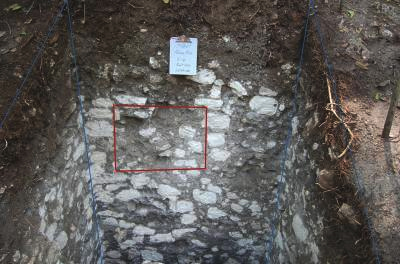 Another discovery by the UC-led team: To help purify water as it sluiced into the reservoir tanks via catchment runoff and canals, the Maya employed deliberately positioned “sand boxes” that served to filter the water as it entered into the reservoirs. “These filtration beds consisted of quartz sand, which is not naturally found in the greater Tikal area. The Maya of Tikal traveled at least 20 miles (about 30 kilometers) to obtain the quartz sand to create their water filters. It was a fairly laborious transportation effort. That speaks to the value they placed on water and water management,” said UC’s Nicholas Dunning. 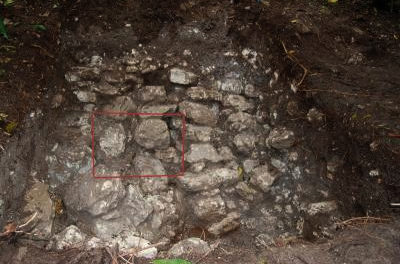 UC paleoethnobotanist David Lentz explained that the sophisticated water management practiced by the ancient Maya impacted the availability of food, fuel, medicinal plants and other necessities. He said, “Water management by the Maya included irrigation, which directly impacted how many people could be fed and overall population growth. Accordingly, it is essential to understand the array of canals and reservoirs at Tikal, which conserved water during the annual dry season and controlled floodwaters during the rainy months. These practices allowed the Tikal Maya to sustain relatively high population densities for several centuries. Of significance to Scarborough and the entire team are the potential lessons that can be gleaned from identifying a water system like that at ancient Tikal. Said Scarborough, “Water management in the ancient context can be dismissed as less relevant to our current water crisis because of its lack of technological sophistication. Nevertheless, in many areas of the world today, the energy requirements for even simple pumping and filtering devices – to say nothing about replacement-part acquisition – challenges access to potable sources. Tropical settings can be especially difficult regions because of high infectious disease loads borne by unfiltered water schemes.